Round tables can be challenging at certain events. They are great for business cards or pens that display company information or promotional items. These can be especially useful in small spaces. But they can be hard to cover and a tripping hazard. A round stretch table cover is a great fit for any event. Round Stretch table covers cling tightly to the top of the table and fall evenly to the floor, remaining tight. 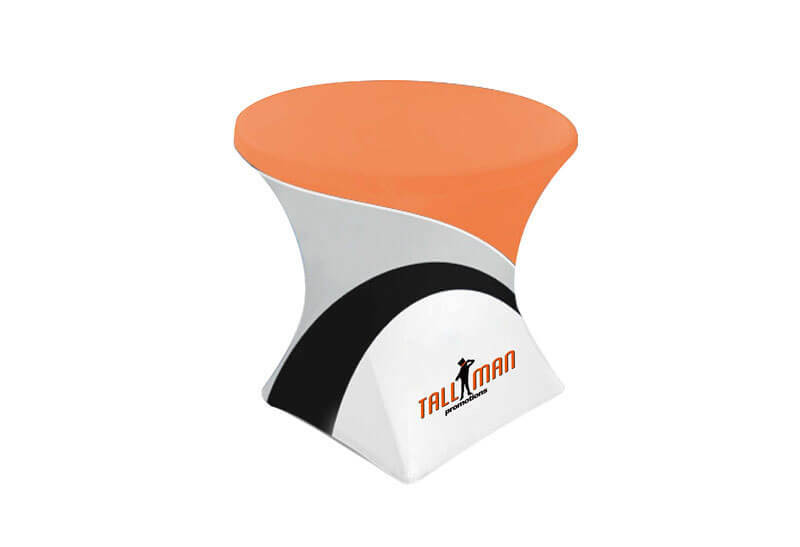 Display your logo as you wish for maximum exposure with a round stretch table cover. Every inch of the fabric is tight, so no flapping fabric. We offer four standard size table covers (see our list), however, we can create elastic table covers for any table size. If you need a custom table cover, contact us today. Table covers have endless possibilities for design. If you need help we can design your table cover for you, or we can use your design. Table covers can be screen or dye sublimation printed giving you complete creativity in design. If you need a custom table cover, contact us today. Stretch table covers are made using a 180g Stretch Polyester material.